Advantages: Over 50 period photographs and another dozen colour close-ups; 4 well-executed aircraft profiles; detailed 1:48 scale drawings; easy to read narrative; discussion of colours and markings. It was authored by Gregory Alegi and now, more than 60 issues later, he’s back to take the reins again and present a more detailed look at this popular aircraft. A lot of fresh information can be found within the 36 pages. The soft card covers are graced with the superb artwork of Ronny Bar where he contributes 3 colour profiles of the Caproni Ca.3 and one of a Caproni CEP.1. Also found here is a full colour contemporary cutaway drawn by the Caproni company around the time of the end of the war. Over 50 archive photographs are reproduced and the author has been careful to pick them for their relevancy. Each is well captioned with the information contributing to the narrative rather than repeating it. Colour close-ups are a feature of this edition and these come courtesy of the Italian Air Force Museum’s post-war Ca.3 and the restored Caproni in the National Museum of the USAF. These two aircraft provide interesting views of the cockpit, engine installation and airframe details. There are 6 pages of detailed scale drawings from the hand of Marty Digmayer. These are in 1:48 scale only and one presumes that the 1:72 scale versions will appear in next installment of this series. 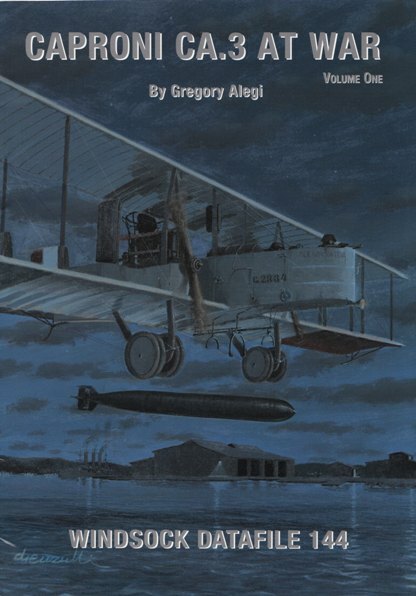 The author does an excellent job of taking the reader through the history of this aircraft. The text is easy to read and the included colours and markings section will be appreciated by all aficionados. The information is based on surviving fabric specimens, photographic evidence and period colour illustrations as no official painting instructions have surfaced. This is complimented by the extensive footnotes, as well as listings for production orders, serial numbers, specification tables and performance figures. The result is a fine start to the 2-part series on this iconic aircraft. With a lot of new material presented it’s the ideal reference sources for both modellers and enthusiasts alike.